A truly exceptional megayacht, Martha Ann is a 230′ Lürssen built in 2008 to the highest standards by one of the most prestigious shipyards in the world. The yacht has been continuously maintained since her debut on the international charter scene including her latest refit in 2016. Designed by Naval Architect Espen Oeino, she has immense volume. Her 42′ beam, 5 decks for guests, and 13,000 square feet of air-conditioned living space create the canvas for a grand and opulent interior. Award-winning designer, Francois Zuretti, is responsible for her lavish interior design which is finished in a striking display of mahogany paneling throughout and marble and onyx counter tops. The bespoke furnishings and soft goods were chosen by the owner, an experienced yachtsman who was also involved in every stage of her conception, design and build. She has a range of 6,000 nautical miles at 12 knots and is a proven oceangoing performer. At anchor stabilization ensures a comfortable voyage. 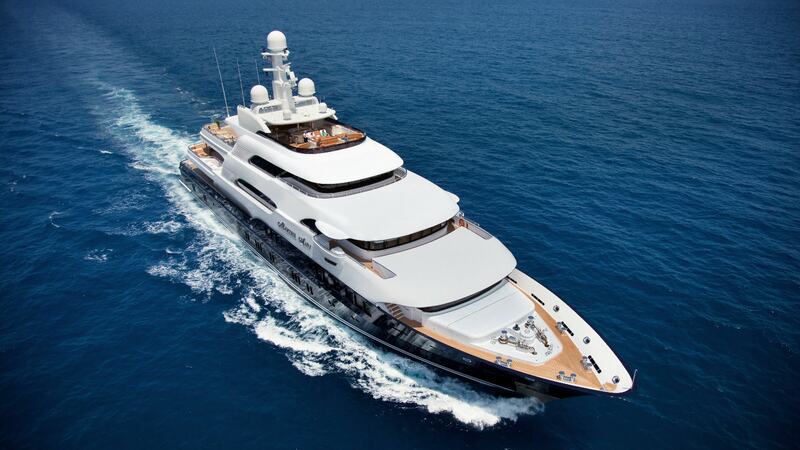 Also click here to find more Lürssen Yachts! Martha Aann is an ideal charter vessel, with a host of unique amenities found throughout the yacht. A baby grand digital piano in the Main Salon is a sophisticated addition to the almost unlimited music and movie collection on the Kaleidescape entertainment system. In the Skylounge, a large wet bar, games table, and 2 large TV’s provide the focus for an evening of lively entertainment. On the Sports Deck, guests will find a state-of-the-art movie theater with projection screen, a large air conditioned gym with commercial grade equipment, and a Swim Spa with complete with swim up barstools to the adjacent wet bar. The sumptuous full-width, split-level Master Suite is located on the Main Deck forward with King bed, private study, his/hers bathrooms and a raised private lounge forward. Access to the Guest Accommodation Deck below is from the Grand Foyer, with its centerpiece circular glass elevator, or winding central staircase, finished with a lustrous wood paneling. The Guest Staterooms are equally well-appointed: the 4 en suite staterooms below feature King beds, marble bathrooms, generous walk-in closets, desks and TVs. A King VIP Stateroom is situated on the Bridge Deck for guests who prefer additional privacy. Also located below is an en suite staff / children’s stateroom. Options for water toys, tenders, and activities abound on Martha Ann, with a full-width Toy Garage to house them all. A 26′ Limo Tender will whisk away guests wishing to explore or shop the local ports of call. Waverunners, kayaks and waterskis, are just a few exciting water sport activities. Back onboard, spacious sun-drenched or shaded deck areas offer relaxation with a frosty beverage or dining alfresco. For an exceptional yacht charter experience, choose Martha Ann for your next adventure in luxurious surroundings.